The archetypal sad song is probably found in Psalm 137. It reads: “By the streams of Babylon we sat and wept when we remembered Zion. . . .And though our despoilers urged us to be joyful, ‘Sing for us the songs of Zion,’ how could we sing a song of the Lord in a foreign land?” Sad songs involve remembering and weeping, injustice and joys. The saddest opera that I know is Madama Butterfly. The cross-cultural plot zeros in on nothing less than a promise, an expectation that was unfulfilled, betrayed. I asked a friend here who knows opera well whether Lt. Pinkerton, the American naval officer who left Butterfly to her fate, had any redeeming characteristics. None could be recalled. I vaguely recalled another version of this song. On the Internet, I immediately found Seldom Scene’s haunting version of “With the Small Exception of Me.” I had actually heard them sing it live in Alexandria Virginia, which is what I was remembering. The words are poignant: “Everybody knows you are leaving me for good. / Everyone tells me now they knew you would. / It’s a well-known secret I just couldn’t see, / And the whole world knew with the small exception of me.” Such a song reminds us that the obscure affairs of unknown, ordinary people also bear great drama, great sadness. Take the lyrics of “The Tennessee Waltz”: “I was dancing with my darling to the Tennessee Waltz / when an old friend I happened to see. / I introduced her to my loved one, / and while they were dancing, / my friend stole my true love from me.” This is not exactly Butterfly. All is fair in love and war. But the sentiment, the sadness remains evident. Perhaps the saddest of all is Patsy Cline’s “I Fall to Pieces.” The jilted one is urged by the former lover to find a new love. But, of course, it doesn’t work. For “Each time I see you again, / I fall to pieces. / How can I just be your friend?” The unarticulated answer, of course, is: “You can’t.” Some things are not merely passing affairs. What are we to make of such sad songs? Surely they are part of our being human. I used to have a refrain that kept going through my head, actually a theological refrain: “Would you abolish sadness if you could?” It seems utterly ironic to call Christ, the Man-God, the “man of sorrows.” This name meant that sorrow and sadness would not be abolished from our lives in this world. “Why not?”, we wonder. If we look at Butterfly and each of the songs that I cited, all of them involve a freedom that is essential to lost or betrayed relationships. That freedom involves a fidelity that cannot and must not be forced. The character of each person is revealed in his actions – the “everybody knew,” the stealing, the falling to pieces. We might say to Butterfly: “Look, Pinkerton wasn’t worth it. You misjudged him. You are better off without him.” When Pinkerton comes back to Japan with a fancy American wife, he expects Butterfly to have moved on into normal Japanese society. He did not realize what Butterfly saw in him. Would his American wife have understood Butterfly’s final act? I sometimes think that we can define our lives in these terms – the whole world knows with the small exception of me. Self-knowledge, as Socrates taught us, is hard to come by. Listening to these sad songs, one cannot help but think that they make known precisely what is in Luke. They bring forth from the darkness the incidents and choices that cause sadness among us. One way of dealing with them is to sing about them. Yet all sad songs have this “remembering Zion” about them, this sense of how things might have been but were not. The Man of Sorrows’ love was and still is rejected by many. He did not abolish sadness. He redeemed us through it. It is not the greatest evil. This awareness of what is at stake is what we learn from listening to the sad songs of our kind, songs from the streams of Babylon to the waltzes danced in Tennessee. 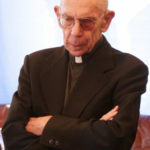 James V. Schall, S.J., who served as a professor at Georgetown University for thirty-five years, is one of the most prolific Catholic writers in America. Among his many books are The Mind That Is Catholic, The Modern Age, Political Philosophy and Revelation: A Catholic Reading, Reasonable Pleasures, Docilitas: On Teaching and Being Taught, Catholicism and Intelligence, and, most recently, On Islam: A Chronological Record, 2002-2018.